Today’s segments include contest details, Ever-expanding Skill Set, and A Little Bit of Learning. To enter the contest, think of a meaningful teacher in your life. It may be someone who taught you in a classroom, or someone from whom you learned in a less formal environment. Write a letter to that teacher and mail it. Finally, post a tribute to that teacher by clicking the leave a reply button above to add a comment. You have until October 31st to enter. 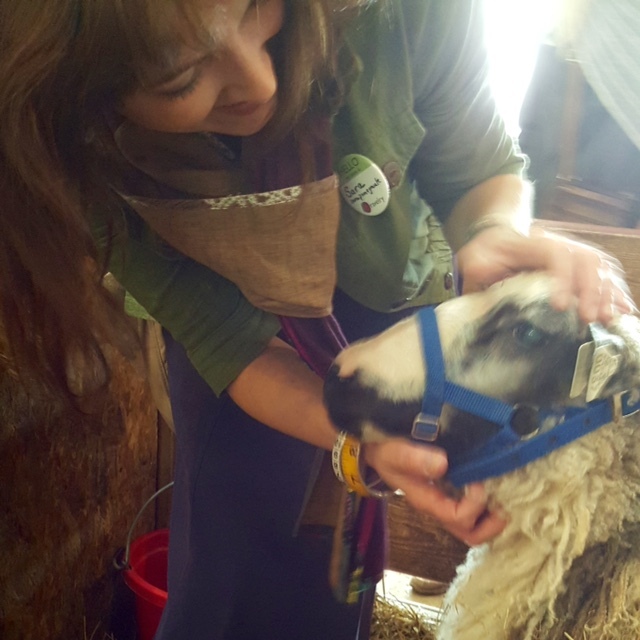 A specially-made purchase at Rhinebeck will be awarded in a random prize drawing at the beginning of November. This contest is a joint venture with Dr. Kelly of Ewe University. Check out her podcast for additional ways to enter. 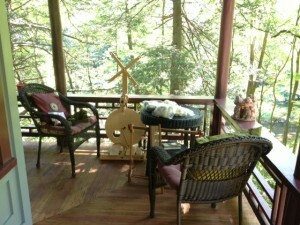 Ravelry members can also enter by joining the Yarns at Yin Hoo group and posting to the contest thread. Today was Day 2 of dyeing fiber. 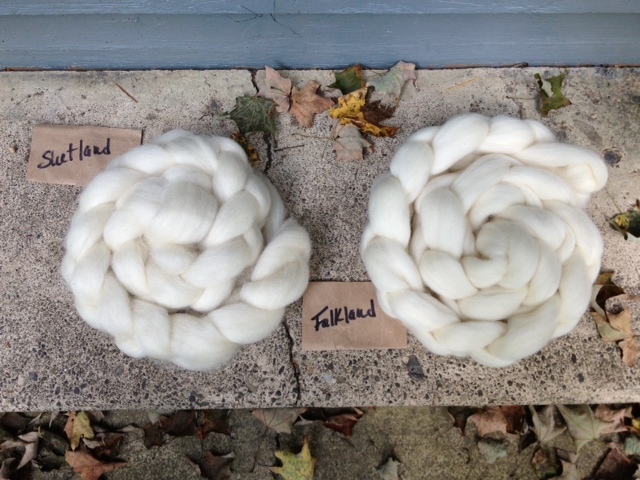 I selected about 100 grams of Shetland from Spinner’s End Farm and another 100 grams of Falkland from Feederbrook Farm. I’d like to see if there’s any difference in how two fibers take on the same natural dye. After enhancing the dye I made last week with the addition of more goldenrod flowers, I formulated a mordant for the fiber. 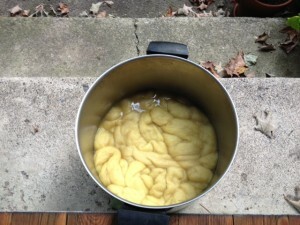 The word mordant comes from the French mordre, meaning “to bite.” So, a mordant helps the fiber absorb the dye when you introduce it. Following the directions on Echoes of a Dream blog, I used 40 grams of alum and 35 grams of cream of tartar for each 100 grams of fiber. I dissolved each powder into boiling water and created a mordant “bath.” After simmering pre-soaked fiber in the mordant solution for about an hour, I gently smushed most of the liquid out of the fiber and introduced it to the dye. The fiber simmered in its dye bath for about an hour. Here it is, cooling in the dye pot. 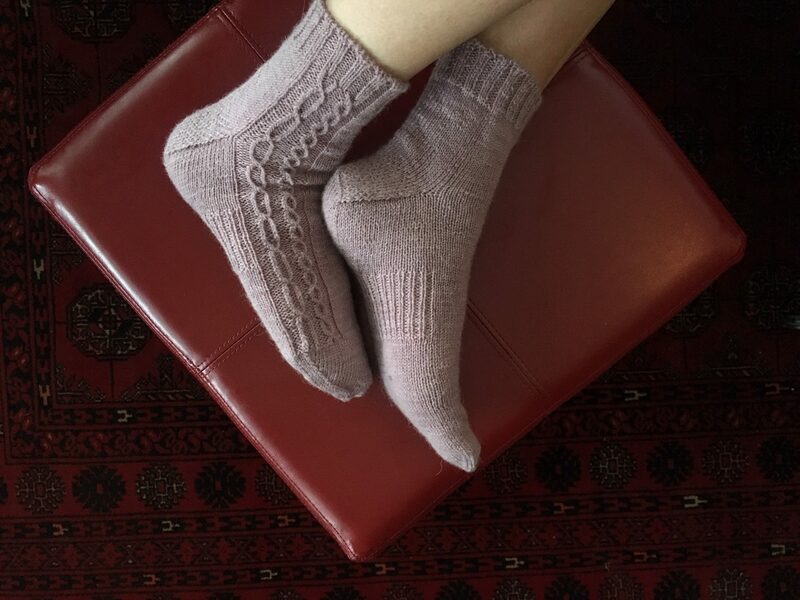 After mentioning metaphor briefly last week, in a discussion of Clara Parkes’ The Yarn Whisperer: My Unexpected Life in Knitting, I decided to include a little more investigation of metaphor in this episode. My resource is I Is an Other by James Geary. I’ve been thinking about this for a L-o-n-g time. Decades in fact.